Our sun-bathed (when it shines!) house from the 1930s is completely renovated and newly furnished for you. It is located on the sunny side of the Moselle in Cochem-Cond on the road to Valwig. Our back garden borders with a vineyard, together with the neighbours' gardens. Downstairs, there are 2 garages with internal access to the house entrance. On the ground floor, you find the large kitchen with dining area and terrace access. The adjoining open living room has a fireplace. In the staircase on the same level, there is a guest WC and access to the terrace. The first floor with balcony consists of a large bedroom with double bed and sofa as well as a smaller double room, both with views of Cochem castle. Both rooms have a spacious shower room. There is a large bedroom with double bed, chest of drawers and table and a smaller double room on the top floor. Both rooms have a full bathroom. Equipment: All rooms, even the bathrooms and the guest WC, have at least one window. The living rooms and bedrooms as well as the kitchen and bathrooms are all equipped with oiled wood floors and partly with high standard carpets. The house is fully equipped with cutlery, crockery, dishwasher, towels, bed linen, washing machine, dryer, etc. In the living room, there are a hi-fi stereo system with iPod connection, CD player, radio DVD player and satellite TV. Our house is perfect also for accommodating only few people and is an ideal retreat for everyone wanting to enjoy the tranquillity, without compromising on proximity to restaurants and urban atmosphere. The house is fantastic in every way, garage parking, spacious inside and a short walk over the bridge into town. We would definitely use again - what a prize find. I was a bit hesitant renting a house half way around the world from a perfect stranger and my concerns were unwarranted. The homeowner was very responsive to my inquires and the caretaker next door made our arrival seamless. The house was clean and perfect for our group of seven ranging from age 25 to 76. The house is spacious and we enjoyed cooking in the kitchen and relaxing on the back deck - great for our group rather than being cooped up in hotel rooms. Going into town was a short five minute walk over the bridge to all the sight seeing destinations, restaurants and shopping. I would recommend Haus Rosa if your plans include Cochem or the surrounding area. Thank you, we like to give our best! I like this place very much. It was centrally located without being in a noisy area, and was reasonable walking distance to restaurants, dining, shopping, and the train (although I would not recommend visiting the area without a car). The street is a main street, but noise was not an issue at all. The beds were comfortable, but the master bed seemed slightly rickety. My main issue was with the laundry facilities; the dryer war not working, and, while the owners expressed their regrets, no effort was made to repair the dryer or suggest alternatives. We had been traveling for a week at that point, and were in need of laundry facilities. (We used the bathroom heaters to dry out things.) That is why I don't give this rental five stars. Haus Rosa is in a great location, a short walk to everything in Cochem. It is very quiet, especially at night so a good night sleep is assured. The beds are comfortable. The house was clean, well eqipped, excellent wifi and superb views of the castle from all the bedrooms. The kitchen was well equipped as we ate at home and self catered several times. The washer and dryer are located in the garage and were easy to use. Communication with the owner was easy using email and check in and check out was very easy with the next door neighbor. We were a group of 5 friends from Australia who thoroughly enjoyed our stay in this large and comfortable house and had a fantastic week in Cochem. Would highly recommend this holiday home. Thank you very much, I hope you will come back to Cochem. We loved staying here, the house is huge, spotlessly clean, quiet at night, amenities were top class and was one of the better places we've stayed on our trips through Europe. The view of the town and castle from the bedrooms was amazing. The wifi worked perfectly and the kitchen was fantastic. We walked, towing our cases to and from the train station and it took about 15 minutes and wasn't too hard. We also walked up to the castle from the house. My daughter very much enjoyed our trip to the swimming centre (easy walk along river 1.5 to 2 km, or catch bus - not that frequent though). Go early afternoon to experience waves in the pool and the children's area with slides etc, it's nice and warm in there. An easy bike ride and then hike up to Burg Eltz is also possible for those without transport. thank you very much for your kindly words - we are happy that you had a nice time in Cochem. 5 (old) guys on motorbikes stayed here for 3 nights and found it to be the perfect base for exploring the excellent roads of the region. House is clean and spacious. Garages easily accommodated 5 bikes and would probably take 3 more without a problem (maybe a couple more). Cochem town centre only 10 minutes walk across bridge, so handy for bars and restaurants. Would be great place for a family and/or friends holiday. 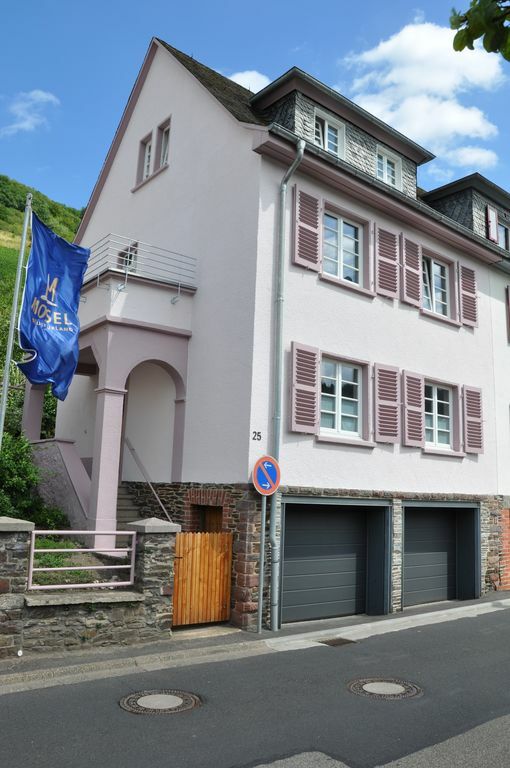 Our house is situated in Cochem, in the district of Cond, about 80 m air-line distance to the right side of the Moselle. The centre of Cochem, Cochem castle, both sides of the Moselle river and the surrounding vineyards can all be reached by foot. There are several leisure possibilities in the surroundings, such as the ropes course Cochemer Klettergarten and the theme park Freizeitpark Klotten. From Cochem, you can easily get to the Hunsrück and the Eifel with their varied hiking possibilities and cultural offers. Die Kosten für Endreinigung, Bettwäsche, Handtücher, Energiekosten, Brennholz, WLan, Telefon, Garagennutzung sind im Preis enthalten. Buchungen während der allgemeinen Schulferien sind nur von Samstag bis Samstag möglich. Während der Weihnachts- und Silvesterzeit sowie über die Osterfeiertage besteht eine Mindestmietzeit von 8 Tagen.